The sheet, which contains (what else?!) an outline of a rainbow with black and white lettering outline underneath, and can be accessed by right clicking on the sheet and saving the image. Students and young children everywhere can fill the colors of a rainbow any way they’d like. After all, that’s what makes it fun! To access your Rainbow Rabbit ‘Color Me Kind’ coloring sheet, click here. Of course, ‘Color Me Kind’ coloring sheets are also available when you purchase our Anti-Bullying Educational Programs as well! 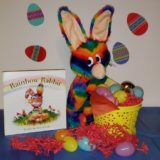 previousEaster 2019 Is Coming; Give Your Children the Gift of Rainbow Rabbit!